Hometown: River Vale, New Jersey, U.S.
Died: February 26, 2005 in Operation Iraqi Freedom. Unit: Army, 6th Squadron, 8th Cavalry Regiment, 4th Brigade, 3rd Infantry Division, Fort Stewart, Ga.
RIVER VALE, N.J. — A 21-year-old soldier from this Bergen County community was killed Saturday when an explosive device detonated near his patrol in Abertha, Iraq, the Defense Department said Tuesday. Pfc. Min Soo Choi died just one month after he was deployed, according to family members. Choi, who was assigned to the 3rd Infantry Division's 6th Squadron, 8th Cavalry, had moved to River Vale with his family from South Korea about seven years ago. Although he was not yet an American citizen, he told a neighbor, Donna LoPiccolo, "I'm just proud to serve." His father, Jung Choi, said his son looked forward to becoming a citizen after completing his military service. Choi was a 2003 graduate of Pascack Valley High School, where he played golf and soccer. School principal Barbara Sapienza described him as "a very well-respected young man." Choi was hoping to pursue a criminal justice degree and a career in the FBI, his father said. Army Pfc. 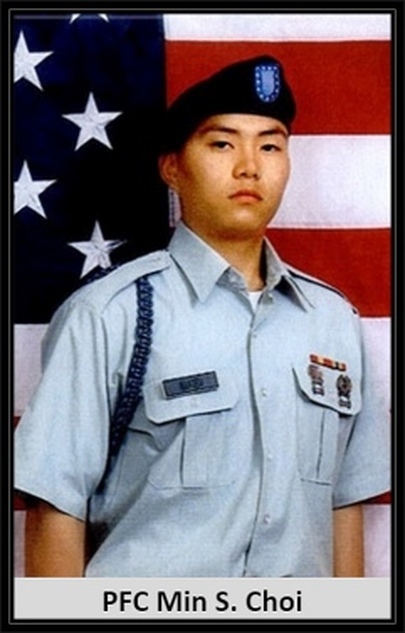 Min Soo Choi of River Vale, NJ., was a 2003 Pascack Valley High graduate had barely finished his first semester at John Jay College in New York, where he was studying criminology, when he decided to enlist. He was in pursuit of a dream. He believed the Army would be a one-way ticket to obtaining American citizenship, a prerequisite for any law enforcement position. But by the time he was deployed, joining the military was more than just a means to an end. The U.S. government posthumously awarded him citizenship during a memorial service held at his alma mater. The 58th immigrant soldier killed in Iraq to be granted citizenship. He was the guy with the beautiful gracious smile. His calm, mature demeanor put those around him at ease. Just being around him made you feel safe. Min Soo loved his sister and took his role as big brother seriously. Before leaving for Iraq with the United States Army he visited his old high school, where she was in her senior year, and asked his guidance counselor for a favor. Take care of my baby sister. To honor the graduate who chose the road less traveled, the high school newspaper printed a memorial edition celebrating Min Soo's life. Featured in the special issue of The Smoke Signal are essays by former teachers, counselors and friends about the kid who, having immigrated to the United States in middle school, barely knew English but eventually graduated from the advanced English as a Second Language (ESL) classes. Also featured in the special issue, she said, are photos of Choi in various sports. Choi was, in true Korean fashion, a member of the school's golf and soccer teams. Min Soo was awarded a Purple Heart, a Bronze Star, a Good Conduct Medal and a Combat Infantry Badge. The River Vale Police Department declared him an honorary police officer and gave his family a badge. A month after Min Soo was deployed, he was killed by an explosive device while on patrol in Abertha at age 21.